We are an authorized Unicel dealer! 90 Sq Ft Length: 17 3/8″ Outside Diameter: 8 15/16″ Top Cap: 4″ Open with molded gasket Bottom Cap: 4″ Open with molded gasket Pleat Count: 174 Works for Hayward Star Clear Plus C900 (CX900 RE), Sta Rite Posi Clear PXC 95 (25230 0095S), Waterway Clearwater II 100 (817 0100N) Replaces part number: Filbur: FC 1292 Pleatco: PA90 Unicel: C 8409 MADE IN THE USA! Top quality, dependable and durable; these are a few of the reasons why Unicel leads the industry in swimming pool filter replacement cartridges. 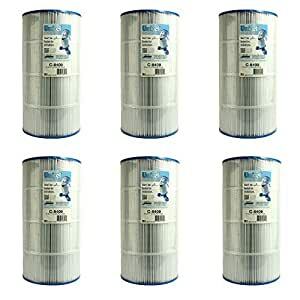 Unicel filters use a unique, synthetic fiber filter media specially designed for the pool and spa industry, creating exceptional dirt catching ability. Easy to clean and easy to replace make Unicel brand filters a great option for your pool or spa.